YAY! More ideas! I love your blog it's so fun! Love those little green trees. They're great! I love the paper wreath. 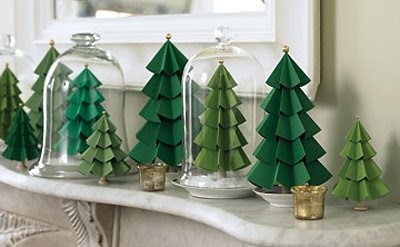 Trees under glass...so Pottery Barn! Loved the fabric Christmas Trees so much I had to try it out! Posted the result on my page! I love your blog and these wonderful ideas! thanks for sharing with your readers. p.s. I mentioned you on our latest entry in our blog! I printed out Flying Bird Ornaments and Paper Evergreens to make with my 5th grade class NEXT year! They are pretty generic for my multi-cultural class. I like it that the kids will have to READ the directions! Thanks for the ideas!